Michael Sam sacks Johnny Manziel!!! In other less important news, Sam Bradford is out for the season. Saturday night in Cleveland, Ohio, Sam’s Rams met Manziel’s Browns in an otherwise meaningless preseason game had it not been for Michael Sam sacking Johnny Football. 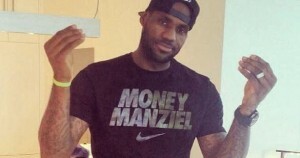 After the takedown, Sam mocked Manziel by doing his patented “money” sign. This is the same game, mind you, in which the oft-unhealthy Sam Bradford tore his ACL yet all anyone could talk about was the sack. Note: a Google search of “Manziel Sam” garnered over 2,500,000 results, one of “Bradford ACL” barely got 500,000. Just goes to show us where our priorities are but I digress. I’m as guilty as the next blogger. Of course, Twitter had a field day with the sack so I say, if you can’t beat ‘em, join ‘em. Here are some of the more comical Tweets that caught my eye from the sack heard round the world. Oh, and here’s wishing Sam Bradford a speedy recovery. So Johnny Manziel has a Drake tattoo on his wrist, and we’re still pretending Michael Sam was the first gay player drafted? OK.
Michael Sam sacking Manziel might be the most talked about but meaningless play in the history of the NFL. Was Michael Sam making the “Money Sign” after he sacked Manziel or trying2 get glitter off his finger tips? Tonight on sports science. Michael Sam sacking manziel. HOW DID HE DO IT?! Monday on First Take: “Did Sam sack Manziel ‘gay enough’?” …and other nonsense for the morons that watch that show. Tomorrow on First Take: Does Michael Sam’s sack of Johnny Manziel make Joe Flacco Elite? We’ll have Jodeci in studio for their take. This entry was posted in Featured, Pigskin and tagged Cleveland Browns, Drake, Johnny Manziel, LeBron James, Michael Sam, NFL, Sam Bradford, St Louis Rams, Twitter by Chris Humpherys. Bookmark the permalink. The two most talked about individuals in this NFL Draft and what they achieved so far this season ? Not much if you look at the preseason stats for this season for both teams . Hype and more hype just as the league wants it to be , while the on-field product continues to remain bland . Not much more needs to be said beyond that . It’s clear we’re talking about them for their off the field activities more so than any on the field statistics they’re compiling. Still, that glitter Tweet was pretty damn funny. Michael Sam will forever be known for the kiss seen around the world , Does that mean the NFL now becomes all inclusive in terms of acceptance ? Speaking of which, all this baseball historical significance concerning the integration of the game was utter bull#hit , when you consider after Robinson’s for the Brooklyn Dodgers , baseball did not have an African-American officiate a Major League game until 1963 . One step at a time was it ? LOL, LOL,LOL !!! Baseball has long been hypocritical, Al, as you’ll find out in my next post on one Peter Rose. And speaking of acceptance, if the use of marijuana eventually becomes legal in this country, how will major sports leagues like the NFL react? I’m still trying to figure out how Pam Bondi and Rick Scott will try strike down the vote if the ballot proposal to legalize weed in Florida becomes legal . One of my best friends has got certified in the state of California to sell the product in legal pharmacies there in the state . Can’t wait for the floodgates to open up here in Florida . Consider what it will do to the illegal meth labs and trade in Central Polk County ? Sheriff Grady Judd will be pis#ed . Manziel will be in for rude awakening this season the NFL if he becomes the Bengals’ starter at the qb position . Is it me but is Kobe Bryant becoming an even bigger a#shole as he gets older ? If he feels he’s underpaid , then he needs to keep it to himself because his opinions are no longer valid or that interesting for that matter . Tell me it wasn’t the Tigers’ intent to let the Kansas City Royals walk away with the AL Central divisional title this season ? Could Detroit have made things any easier for their divisional rival ? The Bucs actually won a preseason game ? What the hell happened ? Pam Bondi and Rick Scott must be dreading the possible passing of the legal marijuana vote . Renowned attorney , John Morgan has to be licking his lips , given the fact he’s spent over $2 million to back the proposed piece of legislation . Dropped some new pieces up at the site if at all interested ? You can also view these via Facebook or twitter. As usual I’ll use e mail to advise of you the latest pieces . Read and comment at your leisure . Your thoughts on the Buccaneers getting Logan Mankins from the Patriots for tight end Tim Wright and a couple of undisclosed picks ? A real shocker for me as a Patriots’ fan ! Mind you Licht as a former Patriots’ front office mid-level executive still has a good relationship with his former employers . hence the trade going off without any real hitches . Mike Slive can’t decide which is more beneficial his dressed in pink or a committee to decide a national champion in College Football at the FBS Level (D1) . I haven’t checked the Vegas line on what week Manziel will end up starting but I’m sure there is one. Hoyer’s every snap will be scrutinized and Pettine will feel plenty of pressure to play Johnny Football. It’ll be interesting to see how a rookie head coach handles that. I’m not quite sure what the hell is going on with the Tigers. They just need to make sure they don’t fall out of contention entirely. They’re a game and a half behind KC and currently behind both Anaheim and Seattle in the wild card standings. As I mentioned in another comment, Al, I like the Mankins pick. Well needed. It’s just gonna take some time for that line to gel and they don’t have much time before Carolina. Sam will be in the lingerie league soon enough, and Manfeel will join that long line of Cleveland legends…Couch….Quinn…McCoy…. Speaking of bad quarterbacks, Bleed, do you know who the all-time passing yardage leader is for the Buccaneers? Yeah… it’s Vinny friggin’ Testaverde. Can we PLEASE get a quarterback in the next decade or so?